My final month as a Marine Savers intern has reached its end! 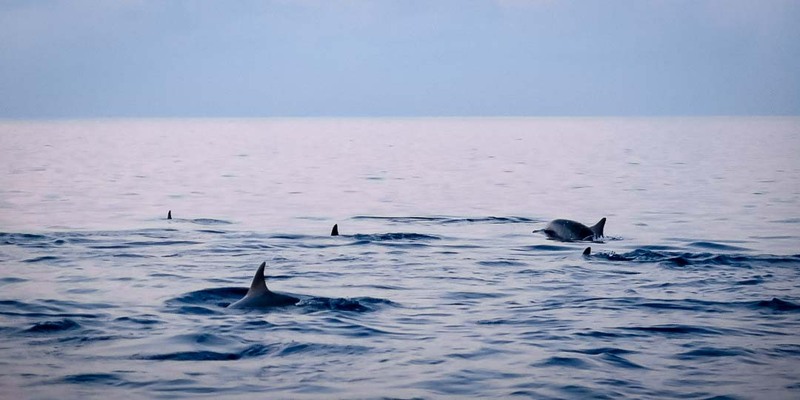 During this busy time, with snorkel activities, dolphin cruises and even some night snorkels, the days have been enjoyable and passed by very quickly. (Here is chapter 1, if you missed it). At the beginning of March, some Kuda Huraa guests found a turtle nest on the beach with eleven baby turtles! They turned out to be Hawksbill hatchlings, ready to begin their adventures in the Indian Ocean, and they were one of the most beautiful things I have seen in the Maldives during my stay. The whole team gathered in the middle of the night to decide the future of these little cuties! We decided to enrol the four weakest hatchlings into our Head Start Programme, and release the other seven the next morning … which was an incredible experience! Early the next morning, we took our ‘whaler’ (a little motor boat) and headed towards the reef outside the atoll. Just as the sun came up, we were so lucky to encounter a group of dolphins that surrounded us and swam alongside our small boat. With the sunrise as a backdrop, watching the little hatchlings swimming away into the big ocean was a magical and unforgettable experience. 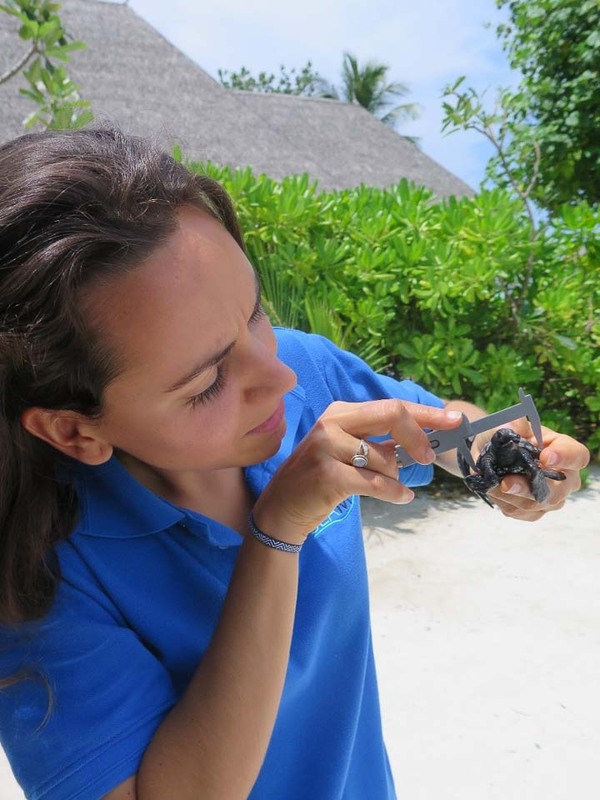 Our Head Start Programme admits and rears the unhealthy and undersized animals from a hatched turtle nest, growing them to 30cm (carapace length) and 4kg in weight, when they will be much more likely to survive in the big ocean. Since they are an endangered species, with this kind of initiative we are trying to help them as much as possible and increase their chances of survival in the wild. One of the hatchlings is particularly special, having a deformed nose, an uneven carapace pattern and unfortunately one eye missing. We named this tiny hatchling ‘Quasimodo’ and he is the most active hatchling of the group! Another memorable day was when five new turtles arrived all at once to our Centre. There were four Olive Ridleys and one Hawksbill sea turtle, found by a group of fishermen, all floating and entangled in the same ghost net, weakened and dehydrated. Most of the Olive Ridleys had missing flippers, and one even had part of the bone protruding from the amputated front flipper. 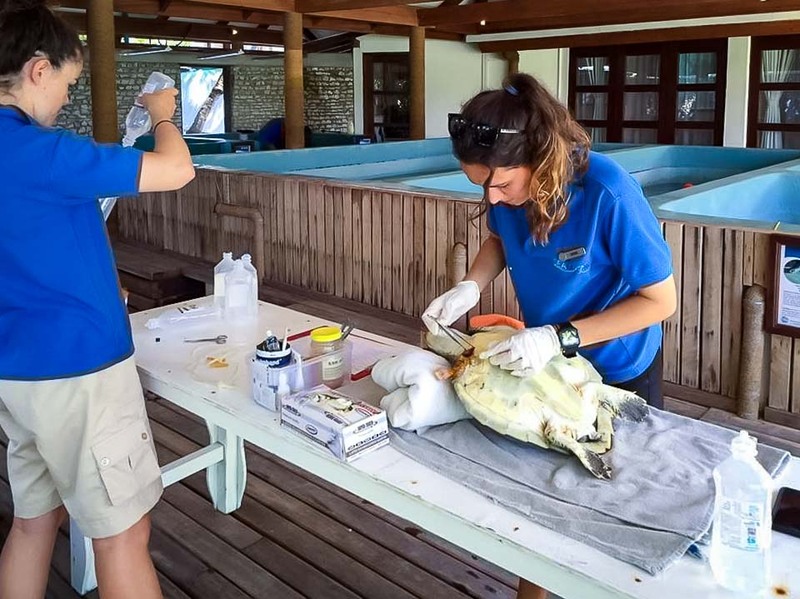 When a new injured animal enters our rehabilitation centre, we record information about the stranding event as well as performing a physical exam of the individual. With these five new sea turtles, we followed our standard procedures and provided basic medical care specific to each case. One of the main problems was the lack of room for so many new turtles. Fortunately, as we are in contact with a veterinarian specialising in marine sea turtles, we were able to send her two of the biggest individuals in the group. She also accepted our invitation to visit our rehabilitation centre to examine all our chelonian patients, and it was nice to talk about veterinary medicine and shared medical turtle experiences. During these months, I have also been carrying out a research project related to the stranding causes in Olive Ridley sea turtles in the central Indian Ocean. With the six-year period of data provided by the Marine Discovery Centre and some scientific bibliography, the most common cause of stranding in Olive Ridleys is entanglement in ghost nets (discarded fishing gear that drifts long distances on oceanic currents). My main goals in this research project are to study the oceanic currents and ghost net distribution in the Indian Ocean, the fishery industry in the southeast of Asia, and the relationship these issues have with the Olive Ridley life cycle. I am learning the way the ocean currents work as well as many interesting facts about marine pollution. During my last weeks in the MDC, I felt very comfortable with the intern duties, and when you like the tasks, the environment and your co-workers, you start to appreciate the small details of the work experience. For instance, the day when some children helped us to feed our rescue sea turtles was so much fun. It was also very interesting to share travel stories with like-minded guests, imparting wanderlust anecdotes to new friends that deserve to be remembered. During these three months, I have felt very lucky getting to know more of the local people, and being immersed in a new language and culture is always a rewarding experience. Also, being so close to so many amazing and different countries in SE Asia encourages you to look for new adventures. 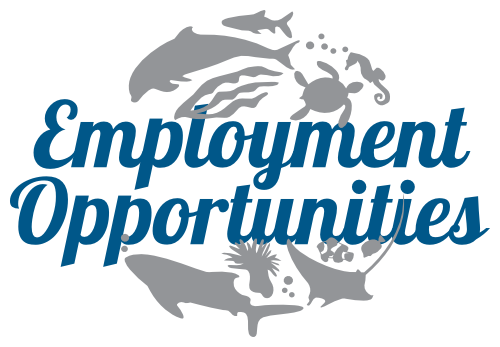 My work experience during these last months in the Maldives also allowed me to look at other possibilities in the career field of marine biology. Every day I have learned new facts about the marine fauna in the Indian Ocean and although I am a Veterinarian, I am seriously considering the possibility of completing a postgraduate study related to the oceans and marine life. I am still interested in animal medicine issues, but where I see myself in a couple of years is actually changing. I really appreciate this internship opportunity, as I now have a clear idea about the kind of job I want to be successful in. I want to thank the Marine Savers team and Four Seasons staff for enabling my fantastic stay in the Maldives. here in the Maldives ? Head over to our Employment page to read about the different ways you can work with us - full time, apprentice or intern. And see more from our Interns in their very own words & photos as part of our Diary / Blog series. The Seamarc team were excellent teachers (thank you!) and everyone was very patient so I learnt very quickly. I will always be eternally grateful for this opportunity ... A very sincere thank you from the bottom of my heart for everyone’s encouragement, hard work and dedication. My short time here has allowed me to learn so many things that otherwise might not have been possible. The memories I have forged here will always have a special place in my heart ♡ … what a wonderful country! From literally stepping out of the airport and onto the resort speedboat, I was completely blown away by how amazing the Maldives is; hot sun, blue skies, and crystal-clear waters … paradise! In my first week, I spent a lot of time learning about and working with the resident sea turtles ... Caring for these turtles has been great fun and each one has its own personality. ... we were lucky to encounter a large pod of false killer whales, which was an incredible experience! The teams at both resorts are a fantastic group of people and I enjoyed every moment working with them all. The first week was a busy one as three new rehab turtles turned up in three consecutive days. I have also been busy with guest snorkel trips, dolphin cruises, scientific projects, coral reef monitoring and surfing world class waves at the local breaks! 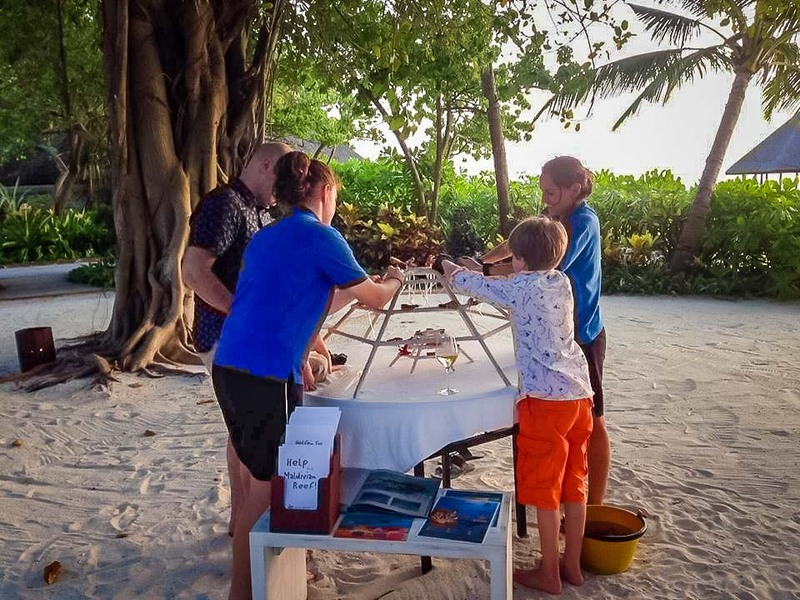 I have been here for the last five wonderful weeks ... such great fun and every day is so varied ... to learn all I can about the amazing marine life in the Maldives. Each morning I caught the local 8:15 ferry boat … much better than the bus in Germany! One day we went to a nearby uninhabited agricultural island, to collect some turtle hatchlings and release them out in the open water. Another great experience was the manta boat-trip ... for one whole day we searched for mantas in different sites around Baa Atoll. 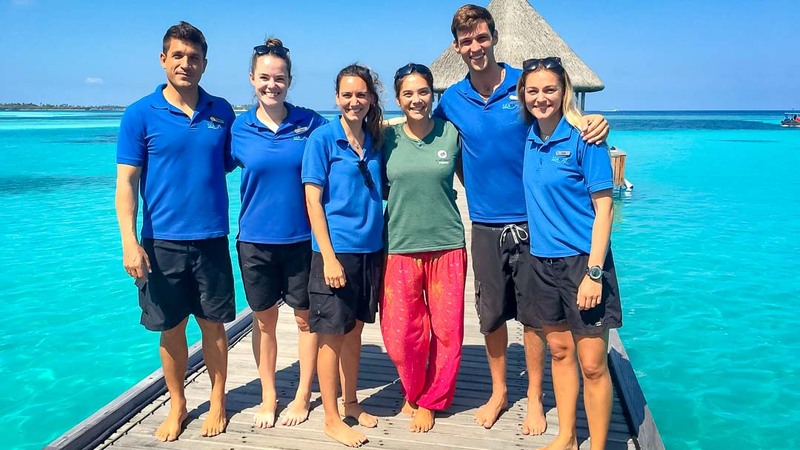 All in all I can say that my 6 weeks’ volunteering ... was a great experience, I met a lot of nice and very friendly people and I learned a lot about turtles, fish species and corals in the beautiful tropical waters around the Maldives. 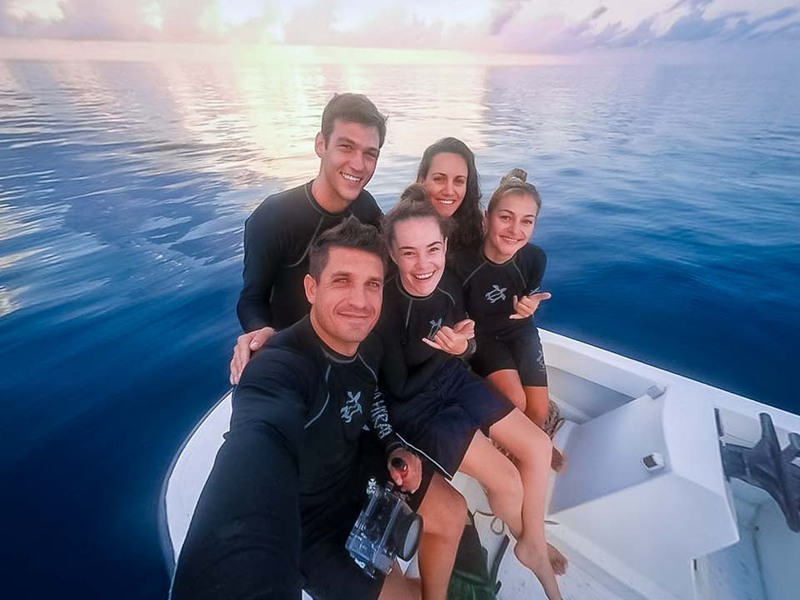 The Marine Savers team is great fun to work with, and I couldn’t have asked for a better location to gain some experience in environmental conservation. It was wonderful to be around so many people who share my passion for the underwater world, and I hope it’s not too long before I’m back beneath the waves in the Maldives! Every day was a different adventure, with turtles to treat, corals to transplant, talks to give and dolphins to spot. It is always a thrill to (see) the juvenile Spinner dolphins, who stick very close to their mothers but are often the most acrobatic jumpers, putting the ‘spin’ in Spinner. Sometimes we were lucky to spot manta rays too. I am very grateful to the Marine Savers team ... It has strengthened my desire to work in marine conservation and I hope to be back in the Maldives one day! You can see some breathtaking marine life here in the Maldives, and every time I’m in the water I feel constantly in awe of my surroundings ... 2 mantas at a cleaning station swam through our dive group, getting extremely close! These activities, along with the people I have met along the way have ... made the experience so enjoyable and memorable. I had never seen a turtle this large before, which was a whole new experience for me in itself ... It took 6 people to get this amazing turtle out of the water and into the boat. 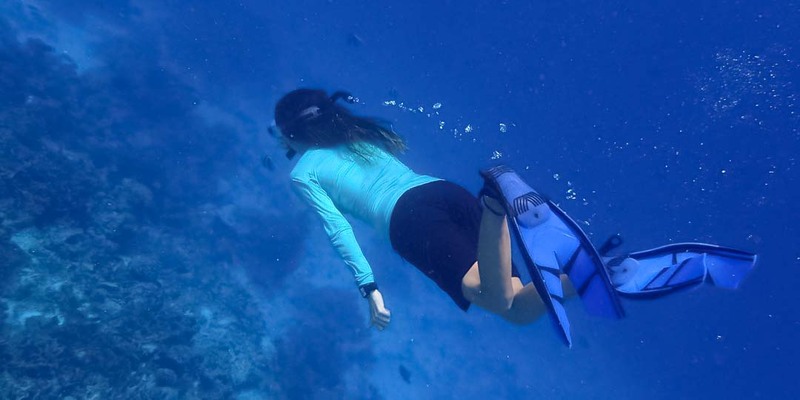 I have even started leading some of the snorkel safaris around nearby reefs, an incredibly rewarding experience to be sharing information and experiences with people. My favourite moments have often been on our dolphin cruises, the incredible spinner dolphins never cease to amaze me as they throw their bodies high above the water surface. That is certainly a sight I will never get tired of! Taking time off work to travel all the way to the Maldives to care for sea turtles might seem a crazy idea to some; for me, however, it was the chance of a lifetime. This was the perfect opportunity to leave my office desk in the concrete jungle of Hong Kong and take part in something meaningful in a unique part of the world. I have had a tremendous time, and have made friends with a lot of lovely people from around the world. I thoroughly enjoyed the experience and would definitely like to come back some day to visit everyone… and the sea turtles too, of course! Winy and Hazel had a very busy and enjoyable time, working with our turtle care patients and the Reefscapers coral propagation programme. They also helped with an important reef clean-up, and had a memorable day releasing baby turtle hatchlings into the ocean. Every day since I have arrived has been an adventure! I am witnessing new and amazing things every day, from sunsets to 'Spanish Dancers' ! It’s a wonderful experience as we share underwater marine life encounters, and I have actually lost count of how many sharks, dolphins and turtles I’ve encountered since I arrived ... and it’s magical every time. The care and rehabilitation of the turtles here is very satisfying work. In just a short few weeks, I have seen Spinner Dolphins, Hawksbill Turtles, Black Tip Reef Sharks and of course lots of colourful and varied marine life ... a wonderful moment each time! All of the experiences have allowed me to make many new friends and gain knowledge and memories that will never be forgotten. Thank you to everyone for making my time here so enjoyable! A very enjoyable part of my job is spreading awareness to the public, to promote better understanding and appreciation for the marine ecosystem. We recently organised a school excursion ... seeing these enthusiastic children learning about the environment brings me joy and hope. My time here has been an amazing experience ... more than just swimming with the fishes and being surrounded by beautiful reefs! Frédéric was a PhD student and lecturer at the National Museum of Natural History in Paris, specialising in ecology and tropical marine biology. During his time with us, Frédéric researched indigenous Echinoderms, and possibly discovered a previously undocumented new species of sea cucumber. Glen worked with us in 2014, developing a shark population survey to study local populations of Blacktip Reef sharks using a variety of survey methods including underwater camera traps, and snorkel surveys. One of our first interns, Dylan (from Singapore's Temasek Polytechnic) had an amazingly unique experience with us. Firstly, he helped with the rescue of a stranded false killer whale 'Haita' (although she sadly did not survive rehabilitation). And then he was invited to the “Marine Mammal Stranding Symposium” (February 2013), to present our work and findings to fellow marine biologists.